It’s a Bird…it’s a Plane…it’s the Golden Age of Comics! Previously on E.A.T.comics: Most historians and scholars say the idea of “comics” began in the late 19th century with The Loves of Mr. Vieux Bois (Topffer) and Hogan’s Alley (Outcault). aka Captain America, was launched in 1941 by Joe Simon and Jack Kirby of Timely Comics (later Marvel). Unlike the DC heroes, Cap premiered in a comic under his own name (Captain America #1). Once a scrawny boy desperate to join the army, Steve Rogers was created to be a super soldier in the midst of WWII. His all-American boy persona and Nazi-fighting adventures were hugely popular with American audiences. These three superheroes have graced the panels of comic books for nearly 80 years. Not only did they pave the way for other superhero stories, but other comic book genres as well. All three have sold thousands of issues, had TV shows and movies, and remain popular figures in current pop culture. 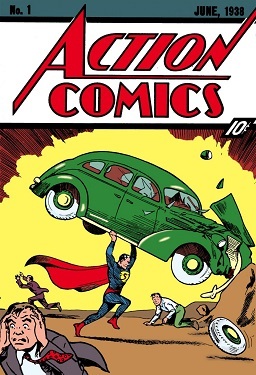 While the years of the era are disputed, most agree that the Golden Age started around 1938 with Superman and ended in the early 50s. Superhero comic books’ popularity began to decline after WWII. But comic books did not die here. They continued to flourish, giving rise to genres such as westerns, sci-fi, romance, crime and horror. Who is your favorite Golden Age superhero? Marvel or DC? A lot of people take sides, but not me. Both are great.